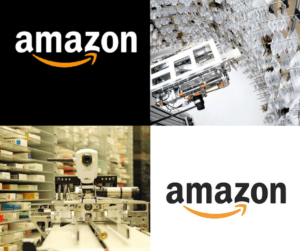 Will Amazon and Robots Take Jobs Away From Pharmacists? While some would immediately and defiantly answer “No”, they may be too quick to judge, as AI has already matured to the point where doctors trust robots (with human supervision) to handle pill distribution with precision. One of the most important things pharmacists are tasked with is making sure the right number of pills in the correct dosage are distributed to the right patients, but now, it seems that robots can handle that task just fine. According to KQED Science, robots may already be better at doing that than people. In fact, “it’s a perfect job for a robot: a repetitive and mundane task,” the author wrote. However, instead of being fearful, many doctors are optimistic about the potential for automation to allow pharmacists to reinvent themselves as a profession. If the pharmacists hope to survive the rise of AI, they must find a way to use it to their advantage without allowing robots to replace them completely–a truly delicate balance. The hospitals needs fewer technicians thanks to the bots, with the remaining technicians being reassigned to other work. Important to note here is the fact that the robots didn’t actually take jobs away from pharmacy technicians, instead, they created and opportunity for the technicians to focus on other (possibly more important) work. Pharmacists can best use AI as a tool for collaboration and as a way to make their jobs easier and executive tasks more efficient. Between CVS and Walgreens, more than 2.5 billion prescriptions are filled annually and these stores employ nearly 120,000 pharmacists, according to CNBC. 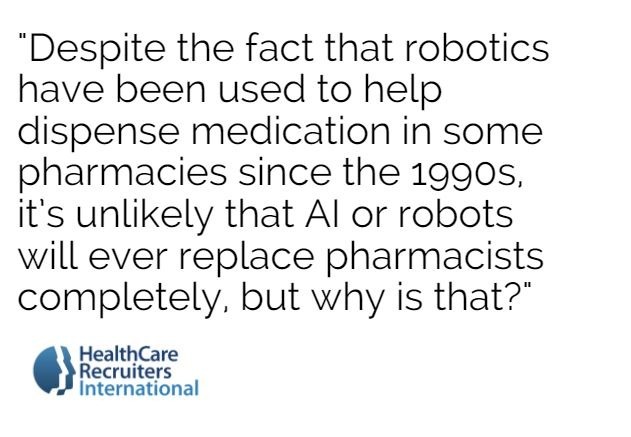 And despite the fact that robotics have been used to help dispense medication in some pharmacies since the 1990s, it’s unlikely that AI or robots will ever replace pharmacists completely, but why is that? 1). There’s a lot more to being a pharmacist than simply dispensing medication. While dispensing medication is part of being a pharmacy, the primary function of a pharmacists is to be a trained expert on pharmaceuticals, their effects, side-effects and interactions with other drugs. If something goes wrong with your meds and you need advice, a pharmacist is best suited to help you. Pharmacists are “a human insurance policy against any and all things about the prescription you’re taking that you might need fact-based subjective advice on,” according to Soliant. Additionally, they can provide a lot of medical advice on minor ailments and can even write prescriptions for certain things. Today, Americans do a lot more than get their prescriptions from pharmacists and that trend is likely to continue. Pharmacists are readily available to help patients monitor progress on their medications, give advice on lifestyle choices and analyze those choices. As the United States population ages and its health continues to decline, the need will continue to increase. Aside from filling prescriptions, robots also handle the delivery of medication to patients around the hospital and use laser “whiskers” to navigate through the winding halls. The challenge is that these wheeled robots simply can’t navigate the diverse environments in clinics and hospitals with reliability. The pharmacy of the future will likely not be fully automated, as pharmacists provide expert level insight, knowledge and management when it comes to pharmaceuticals. For the foreseeable future, AI and robots will not be able to compete with the expertise of pharmacists. What we will see in the near future is an increase in the hybridization of pharmacies to include more AI assistants to handle more mundane and repetitive tasks. That way, pharmacists are freed up to be what’s truly valuable and needed by the community: an expert resource on pharmaceuticals, their effects and interactions. 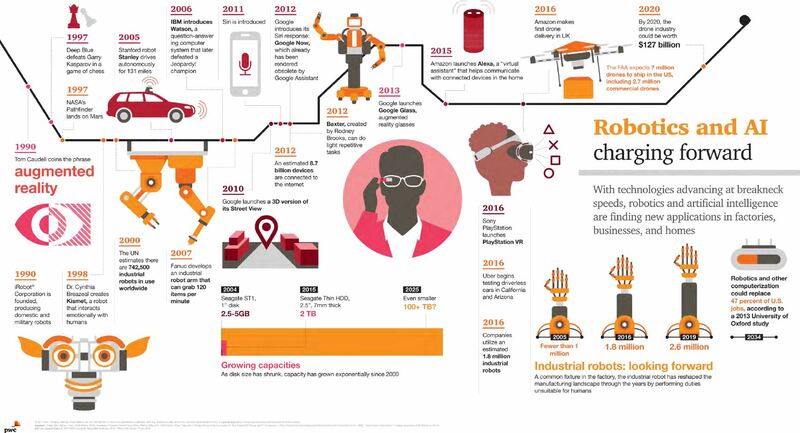 Do you think that robots will take over pharmacies? Let us know your take in the comments below and we will respond. If you’re in need of a new hire in the areas of pharmaceuticals, pharmaceutical executives, or and other practice area, we’re the healthcare industry’s first choice for top talent.